The headstone images below have been submitted or gathered over the years. 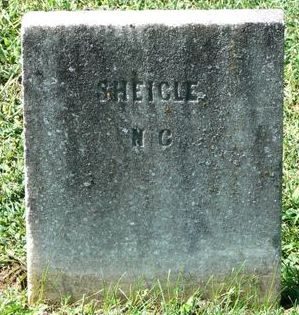 This page contains stones for members of the 14th NC whose last names began with letters from S-Z. Use the drop-down menu or click on the menu at left for additional photo galleries located on this site for names falling between the ranges shown. If you have an image you would like to contribute to the site, please send it to The14thNC@gmail.com. 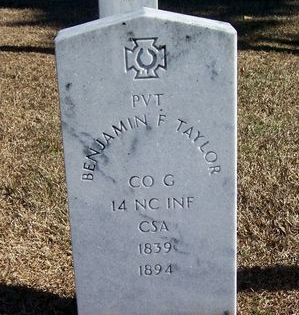 Last name on stone spelled differently from record in NC Troops. Hollywood Cemetery, Richmond, Virginia. Photo courtesy of Dan Janzegers. 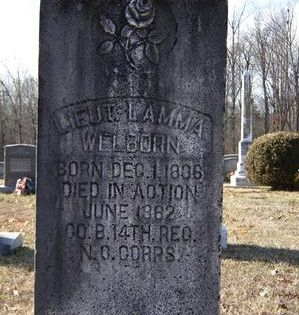 Buried at Epworth United Methodist Church, Carroll County, VA.
Confederate Cemetery, Fredericksburg, VA. Plot: Section 13, Row 2, Grave 24. 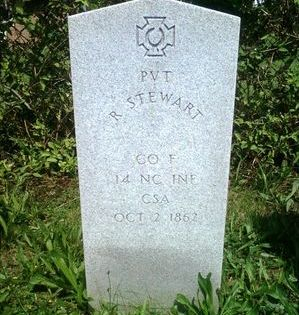 Originally buried at or near Wilderness Church, Chancellorsville, VA. Last name is spelled incorrectly on the stone. Headstone photo by Dan Janzegers. Submitted by Pamela Worley, whose Great-Grand-Uncle is Lt. Shankle. Spotsylvania Confederate Cemetery, Spotsylvania, VA. Photo courtesy of Dan Janzegers. Buried in the Confederate section of Salem Cemetery, 301 Cemetery Street, Winston-Salem, NC. NC Troops states that his first name is Alfred. Buried in the historic Confederate Cemetery located within Oakwood Cemetery, 701 Oakwood Avenue, Raleigh, NC. Pvt. 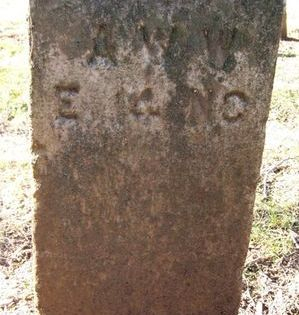 Williams and his wife, Rachel, share a headstone in Sharon Methodist Church Cemetery in Fairview in Buncombe County. Photo courtesy of Si Harrington.